The Hydroscaph Limited Edition Gold Tourbillon, a strictly limited series of 28 watches, is a miniature masterpiece of luxury and technology. Driving hour, minute, retrograde date and power-reserve display functions, the exclusive Clerc movement sets the scene for a tourbillon with bridges that are visible through an openworked dial. This sleekly sophisticated model is designed to trigger great horological thrills for great maritime depths. Clerc Genève already caused a sensation at Baselworld this spring with the ultra-sophisticated Hydroscaph diver‟s watch. Inspired by the conquest of sea-beds, it is equipped with lateral reinforcements and a helium valve enabling it to descend smoothly to the depths of the world‟s oceans. The Geneva-based brand is now back with a new and extremely spectacular version of this model: the Hydroscaph Limited Edition Gold Tourbillon. This precious and timely epitome of technical fine watchmaking is a passport to spine-tingling adventures. As well as being packed with technology, the new Hydroscaph Limited Edition Gold Tourbillon is precious in more than one respect, starting with its „engine‟, an exclusive hand-wound tourbillon movement equipped with twin barrels guaranteeing a 120-hour power reserve. This remarkable autonomy is exceptional for a diver‟s watch and avoids any need to handle the crown while in water. This exclusive 60-second Clerc Tourbillon movement meets the highest standards of Swiss fine watchmaking and drives the hours, minutes, the retrograde date display at 1:30 and the power-reserve indicator at 5 o‟clock. The extremely contemporary openworked dial conceals nothing of the high-precision mechanism, while the S-shaped hollowed vertical tourbillon bridge echoes the scooped-out hour and minute hands. Meanwhile, the numerals and hour-markers are engraved on the inside of the glareproofed sapphire crystal to ensure perfect readability. The precious nature of the new Hydroscaph Limited Edition Gold Tourbillon also stems from its exterior. 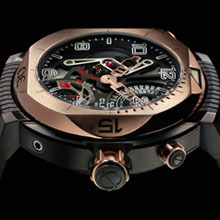 Its generous 49.6 mm case in 18-carat rose gold and black titanium is so complex that it called for more than 75 parts and a brand-new set of construction specifications. Water-resistant to 500 metres, it is fitted with lugs enabling a perfect fit on all wrist sizes and even over a diving suit. However, the most innovative new feature of this model is its rotating bezel with a roller-knob at 10 o‟clock serving to pivot and lock the bezel to the required position. The whole is further secured by unique lateral protective guards that thus avoid any accidental shift in position while diving. for the future to catch up with him, he is already tracing it with watches imbued with breakthrough features stemming from state-of-the-art research in the fields of space and aquatic exploration. Known for embodying a break with conventions, his mechanical techno-luxury creations are governed a single rule: inventiveness. 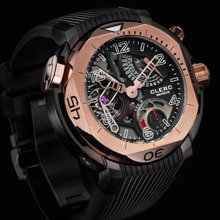 Consistently designed as unique objets d‟art, Clerc watches make no concessions when it comes to improving quality. As Gérald Clerc likes to say: “I create timepieces the way I like them, meaning to uncompromising standards”. Few movers and shakers in the field of Haute Horlogerie can lay claim to enjoying or maintaining such total freedom of choice, a sure token of exclusivity. The extremely distinctive shape of the Hydroscaph bezel – a circle superimposed on a square – is indeed a perfect illustration of this peerless creative liberty. Refusing to be confined by the straightjacket of industrial contingencies, this independent spirit has always preferred to be ruled by the heart in focusing on aesthetic elegance and technical advancement –the universal language of all those who are dedicated to the exceptional.